American orbital launch vehicle. Heavy lift all-cryogenic launch vehicle using two Delta-4 core vehicles as first stage flanking a single core vehicle as second stage. A heavy upper stage is carried with a 5 m diameter payload fairing. 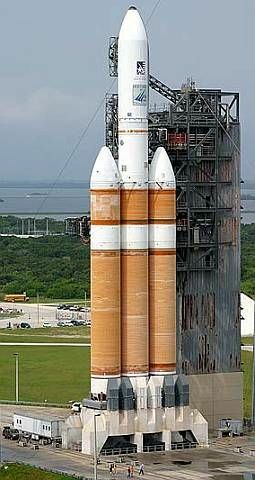 AKA: Delta IV Heavy. Status: Active. First Launch: 2004-12-21. Last Launch: 2019-01-19. Number: 11 . Payload: 25,800 kg (56,800 lb). Thrust: 8,670.00 kN (1,949,090 lbf). Gross mass: 733,400 kg (1,616,800 lb). Height: 70.70 m (231.90 ft). Diameter: 5.00 m (16.40 ft). Span: 15.00 m (49.00 ft). Apogee: 185 km (114 mi). LEO Payload: 25,800 kg (56,800 lb) to a 185 km orbit at 28.50 degrees. Payload: 10,843 kg (23,904 lb) to a GTO, 27 deg. Development Cost $: 500.000 million. Launch Price $: 254.000 million in 2004 dollars in 2002 dollars. Stage 0. 2 x Delta RS-68. Gross Mass: 226,400 kg (499,100 lb). Empty Mass: 26,760 kg (58,990 lb). Thrust (vac): 3,312.755 kN (744,737 lbf). Isp: 420 sec. Burn time: 249 sec. Isp(sl): 365 sec. Diameter: 5.10 m (16.70 ft). Span: 5.10 m (16.70 ft). Length: 40.80 m (133.80 ft). Propellants: Lox/LH2. No Engines: 1. Engine: RS-68. Status: In production. Comments: Low cost expendable stage using lower performance engine. Used in Delta 4, Boeing EELV. Engine can be throttled to 60%. Stage 2. 1 x Delta 4H - 2. Gross Mass: 30,710 kg (67,700 lb). Empty Mass: 3,490 kg (7,690 lb). Thrust (vac): 110.050 kN (24,740 lbf). Isp: 462 sec. Burn time: 1,125 sec. Diameter: 2.44 m (8.00 ft). Span: 5.00 m (16.40 ft). Length: 12.00 m (39.00 ft). Propellants: Lox/LH2. No Engines: 1. Engine: RL-10B-2. Status: In production. Comments: Delta 4 second stage with hydrogen tank increased to 5.1 m diameter. Family: orbital launch vehicle. Country: USA. Engines: RL-10B-2, RS-68. Spacecraft: EIS, DSP, Advanced Orion, 3CSat, Orion. Launch Sites: Cape Canaveral, Cape Canaveral LC37B, Vandenberg SLC6. Stages: Delta 4H-2, Delta RS-68. Agency: Douglas.